Biophysics is a rapidly-evolving interdisciplinary science that applies theories and methods of the physical sciences to questions of biology. Biophysics encompasses many disciplines, including physics, chemistry, mathematics, biology, biochemistry, medicine, pharmacology, physiology, and neuroscience, and it is essential that scientists working in these varied fields are able to understand each other's research. Comprehensive Biophysics will help bridge that communication gap. Written by a team of researchers at the forefront of their respective fields, under the guidance of Chief Editor Edward Egelman, Comprehensive Biophysics provides definitive introductions to a broad array of topics, uniting different areas of biophysics research - from the physical techniques for studying macromolecular structure to protein folding, muscle and molecular motors, cell biophysics, bioenergetics and more. 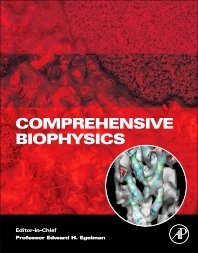 The result is this comprehensive scientific resource - a valuable tool both for helping researchers come to grips quickly with material from related biophysics fields outside their areas of expertise, and for reinforcing their existing knowledge. 1.6.1 The Phase Problem or What Can Go Wrong? 1.6.2 Direct Methods: What We Know About the Unmeasured Phases? 1.6.3 The Patterson Function: Who Needs the Phases? 1.6.8 Frontier Methods: Not General – Yet? 2.10.2 What Is a Speckle and How Is It Formed? 3.14.2 Why Does RNA Need Protein? 4.2.5 How Does the Chemical Reaction Drive Conformational Cycling? 4.10.7 Unconventional Myosins – Single-Headed or Double-Headed? 4.14.10 What Happens Upon Activation? 4.14.12 Does the Folded Form of Smooth Muscle Myosin Exist In Vivo? 4.21.6 Is the Ribosome a Biomolecular Brownian Motor? 4.22.2 What are the Components and Organization of the Packaging Complex? 4.22.3 How is Packaging Initiated? 4.22.4 How is the DNA Translocated? 4.22.5 What are the Organization and Physics of the Genome during and after Packaging? 4.22.6 How is Packaging Terminated? 5.14.1 How Can We Study Membrane Fusion? 5.14.2 Do Membranes Spontaneously Fuse? 5.14.3 Is the Interior of The Fusion Pore Made of Protein or Lipid? 5.14.4 Why Is Synaptic Vesicle Fusion So Fast? 5.14.5 Why Is PtdIns-4,5-P2 Needed for Exocytotic Fusion? 5.14.9 What Can Membrane Fission Tell Us About Membrane Fusion? 6.10.4 Channel or Transporter: What Determines Protein Function? 9.4.1 What Can We Learn from Coarse Grained Models of Lipid Bilayers? 9.4.2 How to Coarse Grain a Lipid Bilayer? Edward Egelman received a BA in physics and a PhD in biophysics from Brandeis University. He was a postdoctoral fellow at the Medical Research Council Laboratory of Molecular Biology in Cambridge, UK, and then an assistant professor at Yale University. He was an associate and full professor at the University of Minnesota Medical School, and then moved to the University of Virginia in 1999 where he is a professor of biochemistry and molecular genetics. He is currently editor-in-chief of Biophysical Journal. He has been elected a fellow of the Biophysical Society and of the American Academy of Microbiology. His research focuses on the structure and function of macromolecular complexes, mainly using electron cryo-microscopy and computational image analysis. He has spent many years studying the structure of F-actin, as well as helical nucleoprotein complexes formed by recombination proteins (such as the bacterial RecA and the eukaryotic Rad51) on DNA. Editor-in-chief of Biophysical Journal. Elected fellow of the Biophysical Society and of the American Academy of Microbiology.